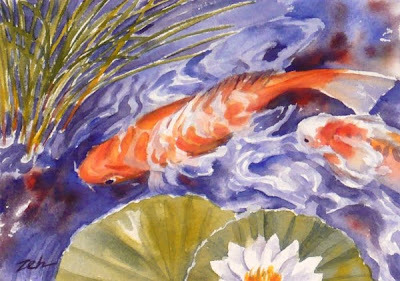 In this fifth painting of koi, the highlights from the swirling water flow over the fish as well as around them. The fish move in an arc in one direction, while the water flows in the opposite direction making a lively composition. This painting has been sold. See more of my art at zehoriginalart.com. Thanks for stopping by. Have a Happy New Year!